Having been rather addicted to understanding electronics lately, I’m always looking for something to play with. Last week I was about to throw out a broken wireless Microsoft mouse, but I caught myself and ended up taking it apart. I dug down to the scroll wheel and found out it was a nice little rotary encoder – there’s an LED pointed at two phototransistors (light detectors) in it, as well as a circle of tiny black posts that pass between the LED and the detectors, as you can see to the left. When the posts pass in front of the detectors, the Arduino reads them and is able to determine which direction they are going and increments or decrements a variable that I can access. It took me about 4 hours to figure out how to hook this thing up, so I figured I would share the info in case someone else wants to use a rotary encoder from a Microsoft mouse in their project. Unlike most of the examples I found for using a rotary encoder, this one requires +Vcc on Pin 2 – power will not flow the other way. The LED power is very picky too; I am powering it from the 5v regulated supply on my Arduino through a 1k resistor to keep the right amount of light in the encoder. Too much light and both sensors will be high for too long and too little, neither will go high. The hardest part to figure out was the voltage divider circuit for the sensors. I could get them working ok on an analog input – swinging between about 80-600, but it wasn’t clean enough to input as digital until I found the right resistor: 10k. This nicely divides the input between ground and +5v so the encoder can be read. // These MUST be on interrupt pins! // set the display to " 0"
I recently bought a 2010 Honda Accord Crosstour and was shocked to see how large it really is in my garage! When it’s parked correctly, I have about 18 inches behind it and 26 in front of it, when it’s not, I can’t shut the garage door, or I can’t walk in front of it. As a fun project, I decided to make a device that would let me know when I’m exactly in position! Enter the Arduino. 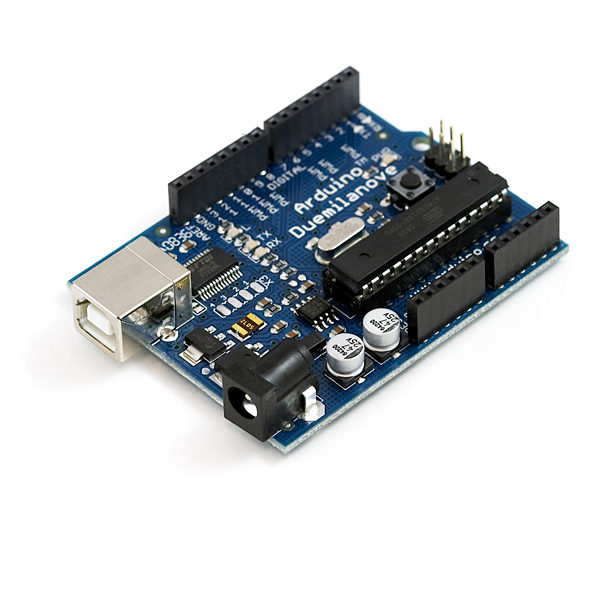 The Arduino is an open-source microcontroller board that can programmed with a C-like language called Processing via USB. It’s a great way to leverage your programming skills to interact with the world around you. In order to help me park my car, I used an ultrasonic range finder from Radio Shack called the PING))) Parallax. This device has a transmitter, receiver and a few processing chips on it. It sends out a signal and listens for the echo, then returns the total time duration in microseconds. Since sound travels one inch in about 74 microseconds, you can take this time and divide it by 74 to get the total distance that the sound traveled, then divide it by 2 since you only care about the distance too the object, not its return trip. My plan was to put the range finder in the back of garage and use three LEDs to show me if my car was too far, too close or parked just the right distance away. I wrote the code below to get a distance reading every 1.5 seconds, and if the distance changed since the last time it was polled, my car (or something in the garage) must have moved. In this case, the Arduino starts polling for changes every 100ms and lights up an orange LED if it is over 26 inches away, a green LED if it is between 26 and 20 inches and a red LED if it is under 20 inches away. I mounted the LEDs on a piece of aluminum and attached it to the wall so I could see it from my car while I’m parking. After I’m finished parking and the Arduino sees that nothing has moved in over 10 seconds, it turns all the LEDs off and starts polling at 1.5 seconds again. Simple and effective! And here it is, the finished product!